TORONTO, March 05, 2019 (GLOBE NEWSWIRE) -- Compass Gold Corp. (TSX-V: CVB) (Compass or the Company) is pleased to provide an update on the progress of the exploration drilling on the Ouassada exploration permit on its Sikasso Property in Southern Mali. Location of RC drill holes and traces (with gold assays projected to surface) at Farabakoura. 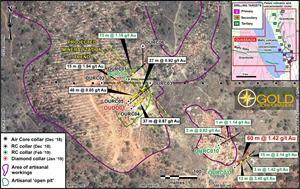 Significant broad gold intercepts with estimated true thickness have been labeled. OURC009 was drilled close to the collar point of OURC001. The hole was 130 m in length, and was designed to intersect an area of extensive artisanal gold workings and determine if mineralization formed a third zone parallel to mineralization noted in OURC004. The assay results (Table 1) indicated that a broad mineralized zone was encountered (13m @ 1.16 g/t Au from 40m), which contained two discrete zones of higher-grade mineralization. This zone appears to correlate with the second zone present in OURC004 and is the focus of the artisanal activity noted in the northeast corner of the pit (Figure 1). Mineralization was present at the contact between granodiorite and a thin (9 m) interval of metagreywacke/metavolcaniclastic. A deeper third zone was not identified prior to the hole terminating at 130 m.
1 Compass believes that the mineralized widths stated approximate true thickness due to the angles observed in the drill core. Drill hole OURC010 was located 310 m to the southeast of OURC009, and was designed to test mineralization beneath an area of active artisanal workings. The hole was drilled to a depth of 135 m from surface, and was planned to intersect possible extensions of mineralization seen at the main workings at Farabakoura pit. Gold mineralization was confined to the granodiorite near the contact with the metagreywacke. Only two noteworthy intervals were recorded within this 10 m low-grade (0.33 g/t Au) zone: 3 m@ 0.62 g/t Au (from 58 m) and 1 m@ 1.14 g/t Au (from 67 m). The final RC hole, OURC011, was drilled 70 m to the southeast of OURC010 beneath a flooded (and abandoned) artisanal pit, and represents the most southernly known mineralization that makes up the shallow Farabakoura workings. It was drilled to a depth of 141 m from surface. Assaying revealed an exceptionally wide intercept of gold mineralization (60 m @ 1.42 g/t Au from 41 m), which constrained four discrete zones of gold mineralization. These zones were: 3 m @ 7.92 g/t Au from 42 m; 7 m @ 2.90 g/t Au from 47 m; 2 m @ 1.95 g/t from 74 m; and 15 m @ 2.14 g/t Au from 86 m. The highest gold grades, and longest intercepts, corresponded to metasedimentary rocks at or near the contact with the granodiorite. In summary, this latest drilling at Farabakoura indicates that the gold mineralization is associated with a series of NW-trending igneous intrusions into the metasedimentary country rock, which have subsequently been cut by mineralized faults. Mineralization has been traced over a distance of 380 m and include relatively broad (up to 60 m), thick mineralized zones containing narrower higher-grade gold zones. Based on the presence of artisanal mine workings in the area, it is likely that additional mineralization will be discovered along strike by drilling. The Company is awaiting the assay result from the single diamond hole (see Compass news release dated February 14, 2019) at Farabakoura. The assay and geological information from this hole will be integrated with the RC drilling data and results from the detailed ground geophysical survey outlined below. Based on this synthesis, Compass will identify areas where addition infill drilling could take place to determine the extent of mineralization at Farabakoura. Additional drilling will also take place on the remaining targets on the Ouassada and Faraba-Coura permits. The previously reported ground geophysical surveys are now underway near the Farabakoura workings on Ouassada, with the first results expected shortly. The induced polarization (IP) ground survey consists of 60-line-kms on the 19 targets identified on the Ouassada and Faraba-Coura permits. The survey is expected to take approximately six weeks. All RC samples were collected following industry best practices, and an appropriate number and type of certified reference materials (standards), blanks and duplicates were inserted to ensure an effective QAQC program was carried out. The samples were prepared and analyzed at SGS SARL (Bamako, Mali) by fire assay analysis. All standard and blank results were reviewed to ensure no failures were detected. *The three holes reported here were all drilled in an east-northeastly direction (at 050° or 060°), at dips of 60°. This direction and dip was determined to intersect the mineralized structures and to provide the best estimate of their true thicknesses. All holes were logged and sampled using industry best practices prior to the samples being dispatched to the assay lab with the appropriate number of standards, blanks and duplicates. This news release has been reviewed and approved by Dr. Sandy Archibald, P.Geo, Compass’s Technical Director, who is the Qualified Person for the technical information in this news release under National Instrument 43-101 standards. This news release contains "forward‐looking information" within the meaning of applicable securities laws, including statements regarding the Company’s planned exploration work and management appointments. Readers are cautioned not to place undue reliance on forward‐looking information. Actual results and developments may differ materially from those contemplated by such information. The statements in this news release are made as of the date hereof. The Company undertakes no obligation to update forward‐looking information except as required by applicable law.